We’re big fans of avoiding gender stereotypes in our household. G does ballet and loves Elsa, pink and the girl pups from Paw Patrol, but she also grew up playing with train tracks, dumper trucks and football. 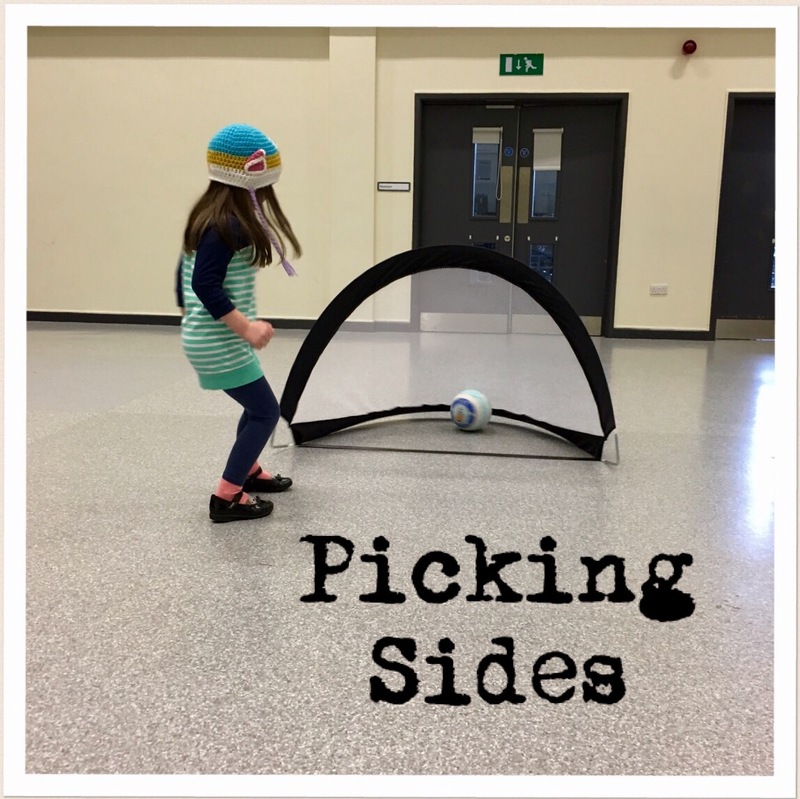 She started playing football when she was 3, at a local class called Diddikicks. She loved it so much she kept going until she turned 6 and she could join the after school football club. C has now started at Diddikicks too and is just about getting the hang of things, and enjoying it as much as her big sister did. Other than her Diddikicks kit, G’s first football kit was a yellow and blue Sweden kit – an awesome gift from her Scandinavian cousins. When she grew out of this and needed a new one for school we gave her a choice of country kits – Scottish like her Dad, Welsh like her Mum or English for where she was born. She chose Welsh, and I had a smug face for days, maybe even weeks. But disaster struck, and the Wales kit went missing. I suspect foul play, but regardless, G needed a kit to wear to football club, so I stiffened my upper lip and we duly trotted off to our local sports shop to pick something up in time for her next class. Not being a huge football fanatic myself, it had kind of passed me by that at some point G might have to choose her football allegiances. And I naively hoped we could simply skirt the issue – after all she’s still a 6 year old girl who struggles to decide what her favourite TV show or breakfast cereal is on a daily basis. But there we were, confronted with a simple, yet baffling choice – Manchester United, Manchester City or Liverpool. G studied the aisle carefully. She picked up one, then another, then started checking for her size, blissfully unaware of the importance of the decision she was making and how it would quite possibly stick with her for the rest of her life. And I did want this to be her decision, not mine. “I want the red one, Mummy!” she started by saying, and so I explained to her that one of the red ones was Liverpool, and the other Manchester United, and did she have a preference? She hesitated, hovering between the shirts, and looked up at me as if expecting me to know the answer. Fast forward a couple of days. Picking her up in the evening after her football class, I asked her if her friends at school had liked her new kit. My heart sank. We’d made such an effort to ensure she hadn’t been put off things like football as a result of being a girl – had all that effort been spoilt by something so simple as picking a shirt? I could feel my blood rising. If mummy’s got new wheels, why not G? It’d been a while since we’d last taken G out on her bike – an intentionally non-girly Thomas the Tank Engine affair that we bought on eBay and that has done sterling service over the past couple of years. But I have to confess to being taken by surprise when I realised quite how much G had grown, as I watched her trying to cycle with her knees almost up to her chin. Even with the seat and handlebars at their highest height, there was no mistaking it was time for a new bike. So the other weekend G went to choose her early birthday present from – where else – Halfords. Because as they said last Christmas, nothing beats a bike. I was slightly concerned that I wouldn’t be able to manoeuvre her past the ‘Frozen’ bike sat front and centre in store, but luckily all I needed to do was say “look, that one’s the same colour as Mummy’s bike” and she was sold on a very cool black and hot pink mean machine, complete with rainbow gloves and a matching Tinkerbell cycling hat. A pink basket for her doll to sit in completed the look and we were off. I’m actually kinda jealous that my bike is missing the pink bits. As it turned out, I shouldn’t have worried about the lure of Frozen. It was more of a challenge prizing G out of the cycle trailer that she’d set herself up in. 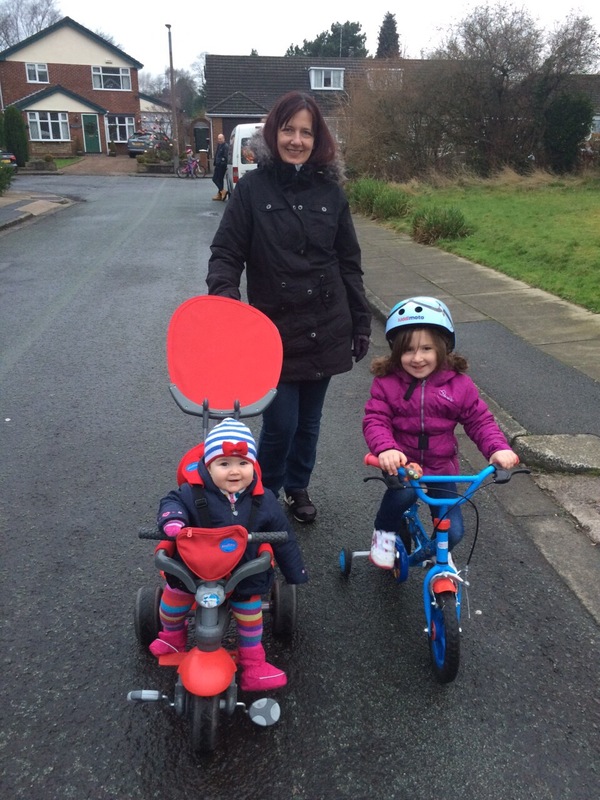 I briefly contemplated splashing out on one so she could come out with us on family bike rides, but quickly remembered that the chances of actually making frequent use of it – however good my intentions – were slim. And apparently it doesn’t fit on the back of a motorbike anyway. 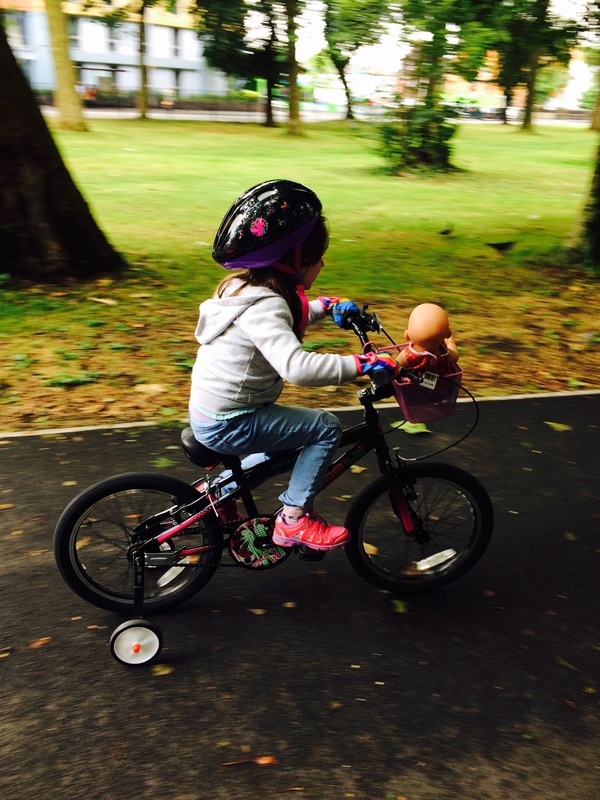 So it was that a few days later we found ourselves in Whitworth Park in Manchester, standing by watching our little speed demon doing laps of the central roundabout, waving at every person she passed and telling them all about her new bike. I’m very pleased she enjoys her new bike so much, and I love her confidence to talk to anybody, especially because she used to be quite shy meeting new people. But I can’t help thinking we might need to have a little chat about stranger danger, if only to spare poor random strangers the ten minute ‘conversation’ about her cycling prowess. Just a few, short nights ago we were sat in a hot tub on the last night of our holiday, under a canopy of trees and stars, debating what our next holiday should be. Of course, that was after we’d been there long enough to forget the joys of the flight over, and before the even bigger joys of the flight back. 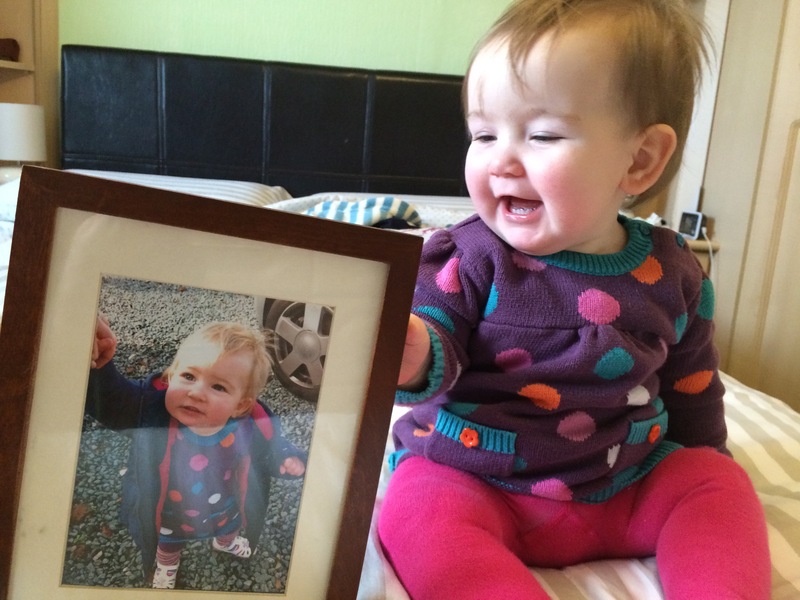 I was actually going to write a post of tips for flying long haul with a fifteen month old. I even drafted it… It was pretty short and sweet. It simply said “don’t do it”. But enough of that. We’ve now been back nearly 3 whole days, and whether it’s the attempt to return to a normal routine, or jet lag, or a bit of both, but among the holiday souvenirs we brought back with us, it appears our children no longer sleep. Usually, if C’s really unsettled, an emergency episode of In The Night Garden is enough to remind her that it’s bedtime. A sign of just how bad things have become: tonight, it took that plus half an episode of Mr Selfridge (she wasn’t a fan), a partial lap of the M60 and the entire Radio 4 shipping forecast… and still no sleep. Seriously? The shipping forecast nearly sent me off! I actually made it back home at one point with what appeared to be a sleeping baby, but she could clearly sense what was going on and promptly started wailing again. To that point, it’s currently 1:40am and I’m sat in the car in one of the more salubrious neighbourhoods of Salford (I figure I’d rather come up against Worsley’s neighbourhood watch than some of Salford’s more colourful nightlife), writing this blog post. Oh, and I almost forgot to mention – the last time I saw Mr Jones, he was blearily trying to coax/bribe a tearful and very awake 5 year old back into her bed. Last night both kids were asleep by 3:30am. Tonight’s looking like it won’t be that far behind. And of course we’ve both got work in the morning. Who ever said having kids was a good idea?! We’re currently on holiday in Canada, where friends of ours got married this weekend (congrats again Sarah and Jon!). This of course means that C has been on her first aeroplane. Two, in fact. Although given she slept right the way through the first one I’m not entirely sure it counts? The prospect of entertaining two little ones for upwards of 12 hours wasn’t one that I was overly excited about, but needs must and we packed accordingly with two Trunki suitcases (genius products, for what its worth!) full of everything I could think of. It turned out that whilst G was more than happy to be occupied by the in flight entertainment (she now has a new found love of My Lttle Pony), the main thing to entertain C was being allowed to sit and stand on my seat. This in turn meant that much of the journey for me was spent sitting on the floor or standing up. Well, they do say you should keep mobile when flying long haul, and I’m sure C was only thinking about my health. Despite everything we made it to Toronto in one piece, albeit tired and minus a couple of bags. The latter was, at least, an excuse to hang out in our Airbnb apartment for most of the following day, waiting for the bags aka slobbing about in yesterday’s clothes. Although the girls have coped with the jet lag admirably, poor C has come down with some kind of stomach bug which meant I got back from the wedding on Saturday night to find a small child not only awake but vomiting all over the apartment. Cue another day in the apartment nursing her / recovering from the festivities. Whilst there’s never a good time to be ill I guess it’s better this way than being on a day when we had to travel or had things booked. She’s much better today, and although she’s not quite herself still she did polish off a pizza this evening and managed some smiles at the Toronto Aquarium we visited earlier. I’ll save that for another day though as it definitely deserves a post of its own! I always thought I would never compare my children. After all, they’re two entirely separate beings, with different personalities, interests and most probably skills. How could I compare them? And being a younger sister myself I was never a fan of always being known as “x’s sister”. But when I was pregnant with C I started thinking about it again. In my head, G was a perfect blend of my husband and I. Surely our offspring would inevitably be like, well, G? And after C arrived I found myself comparing purely so I could better understand what made her unique and different to her big sister. But there are times when I just have to accept that C and G have both come from the same tree. Like when I put C in this hand me down dress and realised there was a picture on the wall of G wearing the same dress, at around the same age. C might have slightly longer and slightly less blonde hair, and have her own distinctive personality traits, but there’s really no denying that they are sisters, is there? Last weekend was G’s 5th birthday party. 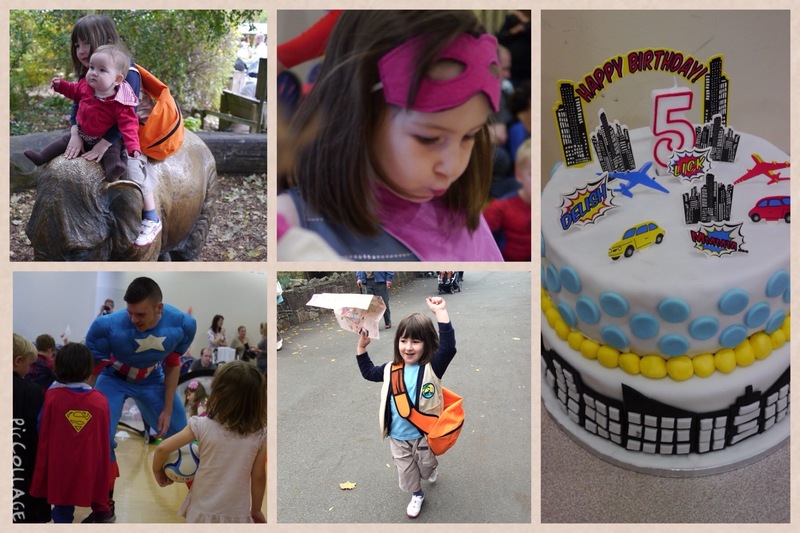 In fact the whole weekend was spent celebrating this event, with our now traditional trip to Chester Zoo on Saturday, and her superhero-football themed birthday party on Sunday. The theme, of course, being what you end up with when you have a fickle nearly five year old who can’t decide what type of party she wants. It was also a weekend for fancy dress, with G’s gift from us for our trip to the zoo a homemade (because you can’t seem to buy them anywhere) Go Diego Go outfit. Slightly obscure, perhaps, but G liked it, and rounded off the day by collecting her own Baby Jaguar (Diego’s sidekick) from the shop. 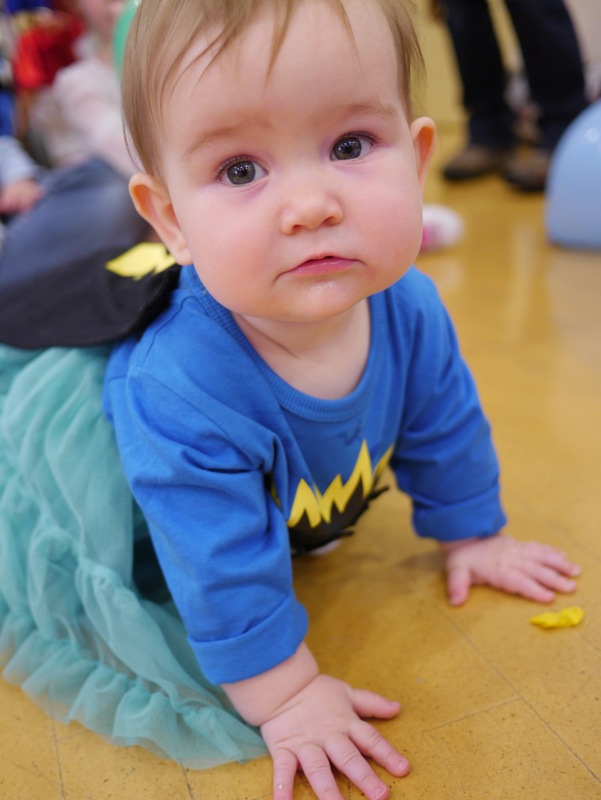 For the party, we already had a superhero outfit for G, and partnered her cape, mask and cuffs with a suitably pretty party dress for the occasion. C, however, had clearly grown out of her last superhero outfit, and needed something new. I’d left it too late to make something for her myself, and quite frankly had worn myself out baking and decorating what I must say was a rather epic looking birthday cake. But thankfully M&S came to the rescue, and tucked away in the boys section (because only boys like to wear superhero stuff, obviously…), I found a rather cool superhero Tshirt complete with attached cape and velcro strips on the front so that you could choose your own superhero word for the front from the included letters – zap, pow or, if you’re a nearly five year old who hasn’t learnt to spell yet, zpo. Teamed with a tutu skirt to up the girly factor she was set to go. 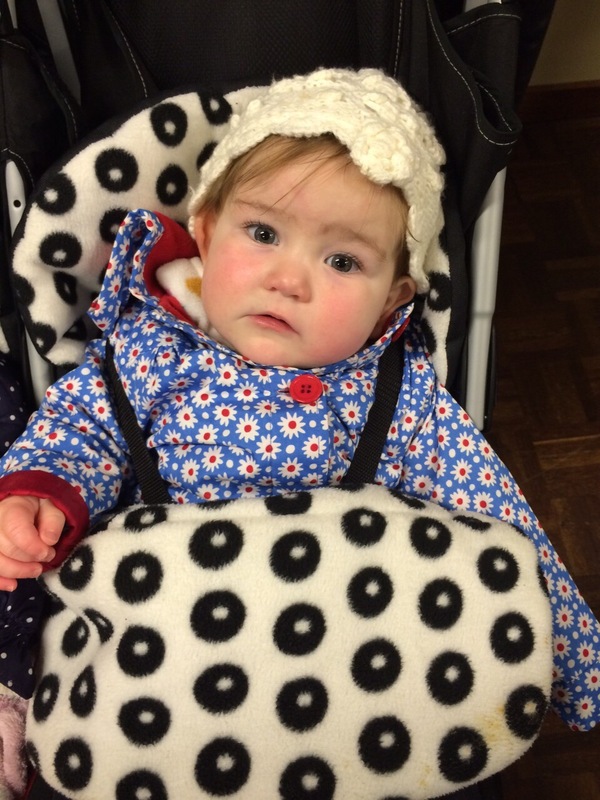 And she came very close to ‘going’ as well – for the last couple of weeks she’s been trying very hard indeed to crawl, and coming very close. She’s not quite figured out what to do with her legs though, so luckily for me I can still put her down and be sure she’ll still be around about there when I turn around. C thoroughly enjoyed the party, being cooed and fussed over by some of G’s friends throughout. However she didn’t enjoy it nearly as much as her big sister, whose football coaches from Diddikicks truly delivered by arriving not only with a host of superhero games for the occasion, but also rocking some rather ace superhero outfits themselves! My own half hearted attempt at a superhero outfit for myself (a cut up Tshirt dress using the neckband to tie it around the neck) was testament to my less than perfect organisation skills for the day, which saw us blowing up balloons in the hallway, hastily making up packed lunches as the children arrived, and stacking cakes at the back of the hall as overexcited 4 year olds ran around our legs. But no matter, they all seemed to enjoy themselves and G left one very happy, and very lucky girl, laden down by rather a lot of lovely and very generous presents! Party done, the only thing that remained was to sit back with a glass of wine. And boy did I need it. Even when we keep a blog or diary, it’s amazing how many of the little things we forget as the kids get older. I was reminded of this last night. We don’t often have a babysitter, but it was our wedding anniversary so we booked one of our ‘regular’ babysitters for a night out. When I say ‘regular’, the last time she came to stay was over a year ago, long before C arrived on the scene (you can tell how often we get out..!). Talking her through the bedtime routine she reminded me that last time she came G was going through a phase of insisting that she wore one sock to bed. Just the one, and it had to be on the right foot, if I remember correctly. Needless to say, G no longer wears one sock to bed. But it did get me thinking of all the other little things that she grows up and out of, but I don’t really want to forget. Like the fact that for about a year when she first learnt to talk bananas were known as ‘lurger-lurgers’. And the fact that she calls own label Shreddies ‘owl treats’ or ‘superhero snacks’ based on the picture on the box (guess where we shop?!). The way if I pretend to pick her up like a baby she shouts ‘I’m not a baby! Look! I’ve got long legs!”. Or the way she would crawl around the house for hours if we’d let her, pretending to be a dog. Yeah ok, so that last one gets a bit annoying after a while. Anyhow, my point still stands. I love seeing my children growing up. But I don’t want to forget the little things that make us laugh and smile along the way. C’s still developing her little personality. She’s already proving to be a little explorer, determined to pull on, open and attempt to climb into every thing she can find, despite not having learnt to crawl yet (although she’s trying very hard). 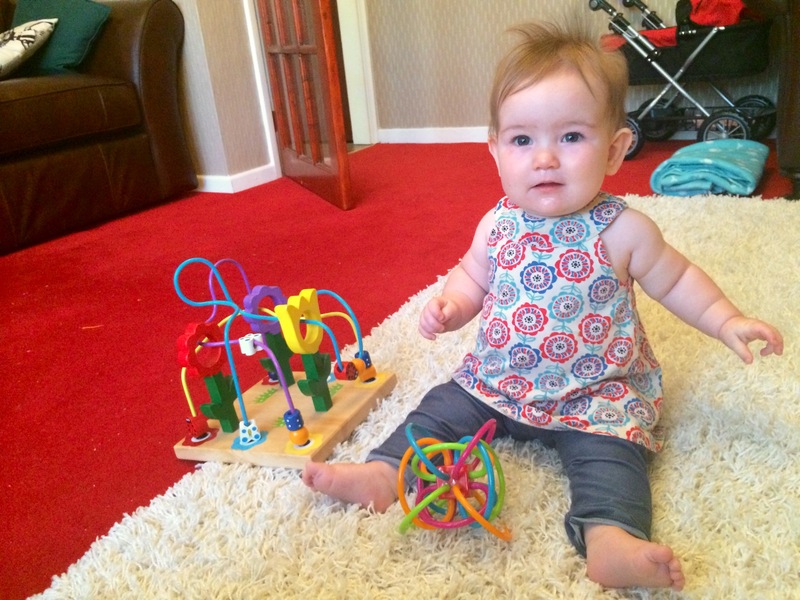 She hates being on her tummy, and will only tolerate being laid down for a short while – ever since she learnt to sit she wants to sit and watch, reach and grab at anything within a 3 foot radius. She smiles and laughs at the sight of her big sister or daddy coming home from school or work, and stares fixedly at people she doesn’t yet know, taking everything in before she decides whether she’s going to smile at them or not. And she certainly knows how to get what she wants, mostly by shouting and looking at you pointedly until you figure out what it is. The quote “she may be small, but she is fierce” seems rather apt for my littlest girl! If you’re interested, we had a lovely night out for our anniversary, with all you can eat ribs and chicken at the Southern Eleven restaurant in Manchester. 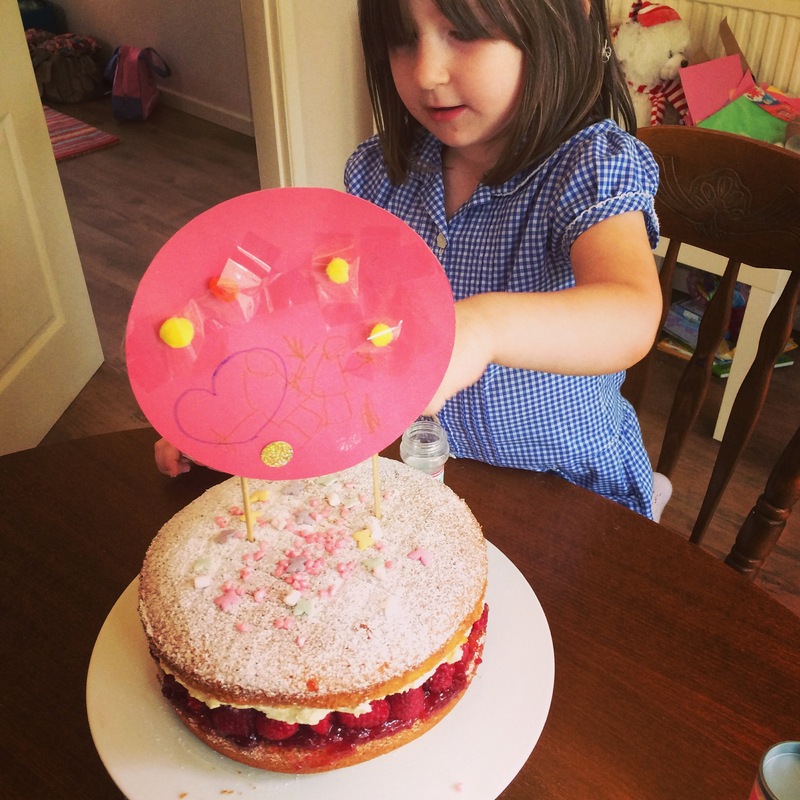 And we came home almost too full to sample the cake I’d made earlier in the day at G’s request, mostly so that she could decorate it in her usual inimitable style. Coincidentally this evening, the story of how the husband and I first met has been immortalised in a BBC Online news story. No, our anniversary isn’t that big news – it turns out the venue where we first met, The Cockpit in Leeds, has closed down. Sad times all round, and an opportunity to reminisce over the little things that happened during our university days, that otherwise might be forgotten.